Lisa Schroeder, Author: What do we authors DO all day? I haven't done any novel writing in a couple of months. So what have I been doing? Skype visits, a school visit, a writing workshop for kids, blogging, tweeting, vacationing, and then the normal day-to-day stuff. What is the normal day-to-day stuff, you ask? I thought it'd be fun to show you this week's to-do list. 1) Modify middle-school Powerpoint presentation (find more humorous pictures) and figure out how to incorporate it into 45 minute Skype presentation coming up in a few weeks. 2) Outline 15-20 minute talk for B&N Educator Appreciation Night in a few weeks. 3) Answer questions for blog interview. 4) Do guest blog post for Eve's Garden. 5) Do blog post for agent's blog. 6) Do joint interview with Kim for Emily's poetry feature in April. 8) Finish reading Donald Maass' latest book and review on blog. 9) Answer letters from readers. 10) Put together envelopes with bookmarks that I've promised to book clubs, teachers, students, bloggers, etc. and go to the Post Office. 11) Finalize Powerpoint presentations for school visits in May. 12) Deliver a couple of ARCs to local booksellers. 13) Order postcards for Educator Appreciation Night. Hope they get here in time. 14) Figure out if I'm going to the RWA conference so plans on the home front can be made accordingly. And that's just work stuff. All of the personal stuff is a whole other list. Do you love lists like I love lists? It is such a good feeling to scratch something off when it's completed, isn't it? Of those 14 things, I've scratched off 6 things so far. Yeah, I have a lot of work to do in the next three days!! Fun thanks for sharing a day in the life of an author. You got a lot on your plate! And yes, I ADORE lists! Checking things off is its own sort of high :-) Have a great day! That sounds like the life albeit a very busy one!! :) Lists are always great!!!! Thanks for the glimpse into your world! I'm embarrassed to say I haven't started a new novel/picture book in a year and a half. I have, though, been through numerous editor/agent revisions on 3-4 books, which in a lot of ways is like starting a new project. There is no one way to do this writing thing. You are always a good reminder of this for me. 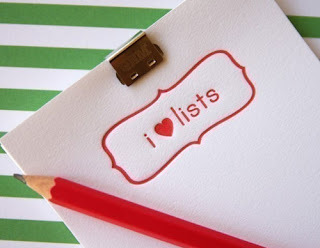 Hi Rachel - yay for lists!!! Hi Jessi - Yes, I'm so thankful to be able to do this job full time now! Hi Caroline - Revisions require a LOT of energy, so it's understandable. I'm fortunate in that I can draft a book pretty quickly, but I need a few months with nothing else going on to do it, and that's getting harder and harder to come by. You are right - we have to figure out what works well for us and do that! Oh, and Hi Kate - thanks for stopping by, from one list lover to another!! Thanks for the list. What a great glimpse into your life.